Día de los Muertos brings back many fond childhood memories for me — from the making of sugar skulls to the annual bus ride to Evergreen Cemetery in East Los Angeles for the night time procession. Sometimes, when people of other cultures hear for the first time about the celebration of the Day of the Dead, they mistakenly think it must be: gruesome, terrifying, scary, ugly and sad. 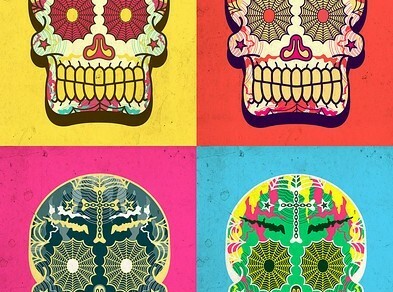 Nothing further from the truth, Day of the Dead is a beautiful ritual in which Mexicans happily and lovingly remember their loved relatives that have died. Today, the celebration means so much more to me on a spiritual level. I find myself thinking a lot about my mom, who passed in 2001 . During this time of year, she would dive into this celebration whole-heartedly, teaching students and teachers alike how to make and paint sugared skulls and decorate classrooms with calaveras and other Day of the Dead imagery. Those were good times. If you’d like to learn more about the history of the Day of the Dead, there are many sites on the Internet. This is a food blog, so we’ll skip the history lesson and go right into some traditional recipes. What I like about both recipes (Atole and Pan de Muerto) is that they can vary from family to family and region to region. You can also find pre-packaged, instant Atole drinks at your local grocery store “Hispanic aisle.” Not the same. Play with this recipe below and make it your own. On this occasion, unique dishes are prepared, and the relatives cook for the enjoyment of the deceased. These culinary offerings are the centerpieces of the altar, which is decorated with flowers, candles, bottles of tequila and other items the deceased may have loved. 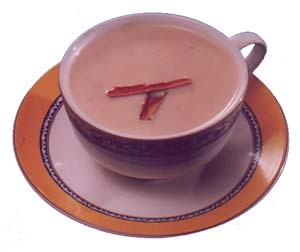 FRUIT ATOLE is a hot drink made differently in different regions of Mexico. This recipe uses corn starch and fruit. 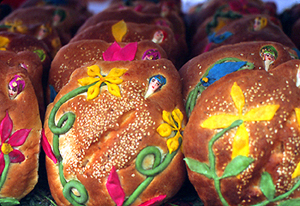 PAN DE MUERTO is a sweet egg bread that can be flavored with fragrant anise, orange zest and cinnamon and is decorated with bone shaped pieces of dough and sprinkled with sparkling sugar. Perfect with hot chocolate, coffee or champurrado. Allow the dough to rest for 10 minutes. Add the butter to the dough working it until fully incorporated. Shape into a ball, grease and lightly flour. Place in bowl and cover with a damp towel to rise for 2 hours. Self Help Graphics & Art welcomes the community to its 38th Annual Día de los Muertos Celebration on Wednesday, November 2nd, 2011. We’ll be volunteering at this event! Come down and say hi. 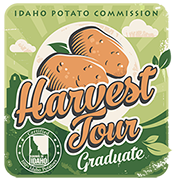 The event features children’s art workshops, 30 art and crafts vendors, elaborate altars, as well as delicious local food. For a full schedule Día de los Muertos activities, please visit Self Help Graphic’s website. Rose Hills Memorial Park & Mortuary celebrates the 2nd Annual Día de los Muertos Cultural Festival and Marketplace with activities including an art exhibit inside the SkyRose Chapel showcasing the talents of various artists, featuring Los Angeles Latino artist Hector Silva. Sunday, October 23, 2011, 11 a.m. to 5:30 p.m. at 3888 Workman Mill Road, Whittier, CA 90601. Event is free. Día de Los Muertos at Olvera Street, Friday, October 28, 2011 to Tuesday, November 22, 2011. Olvera Street claims to have the “the most complete celebration for Dia de los Muertos, the Day of the Dead.” The Festivities will start with the opening reception “Sacred Memories; Contemporary and Cross Cultural Expressions of Day of the Dead” at the Pico House Gallery on Friday October 28th. The exhibition will continue until November 22nd with opening times of Saturday-Wednesday 10am- 3pm (closed 12:30pm-1pm for lunch). For more information call (213) 625-7074.